On 16 Feb, 2013 Geet and I completed three years of our married life. Doesn’t sound like a big achievement, does it? After all there are couples who have spent 50 years together, where the last 10 years of their togetherness have been spent revisiting the potty training manuals, taking sagging body sponge baths via a nurse, exchanging dentures during dinner and spending half of the day getting up from the chair. But these three years of togetherness are an achievement. Especially for a guy who never believed in love. I have seen too many marriages breaking apart around me, too many husbands beating up their wives, too many couples making compromises to believe otherwise. This notion was ingrained in me that no matter how high you are on the initial euphoria, the effect of the drug finally subsides in the morning. Your love life becomes a part of your routine and you get on with it like you get on with brushing your teeth. I was almost 30 and Mom and Dad were panicking because they thought that their crossing-into-middle-age virgin son was going to die a virgin. It was the most terrifying year of my life when I had to finally make a decision. After all it involved another human being and I have to give up the freedom of farting noisily in my bedroom. Too much was on stake. My father created my profile in a matrimonial website and put up a really ugly picture of mine on display. On a scale of Sunil Shetty to 10, I looked like Tushar Kapoor. I went completely numb in the cold matrimonial waters, just like the survivors of Titanic. My virginity ship was about to sink and I watched helplessly as my feet grew cold. M friends told me that it takes 2-3 years to find a bearable bride and given the fact that I looked like a cross between Mamta Banerjee and Prabhu Deva in my matrimonial photo, I extended the duration to 4-5 years and went in my crypt. But Gods had something else in mind. Within a month my parents sent me a girl’s picture (I was in Manchester then) and told me that she was perfect. “Did she see my photo on the website?” I asked in a state of shock. The ship was sinking too fast. I was told that there was a 33/36 match on our horoscopes and I have to stop being an idiot and talk to her. Now this was a turning point. Not that my parents had never called me an idiot but the horoscope match was too perfect. My ghosts of doubts were returning and whispering me to back out. They reminded me that I was incapable of falling in love. Now before you jump to conclusions, what the ghost meant was that I was emotionally incapable of carrying a relationship of such magnitude on my shoulders simple because I did not believe in that gesture. Secondly, what will my friends think? After all, I had distributed such pearls of wisdom like – How can two people stay together their entire lives? I will be bored to death! Ugh! Anyways, I saw her photo and there was a sensation in certain parts of my body. Like near my heart. Let me clarify that it wasn’t lust that prompted me to talk to her. I know better than getting aroused over a photo of a fully dressed female. It was just instinct. We talked how two strangers will talk when they talk for the first time. I tried to be funny and failed and walked into a wall during our conversation. It was a good conversation. Geet tells me that she had fallen for me during the one month we talked on the phone. I liked talking to her but nothing else happened. I don’t know why but I finally said yes. The fact was that both of us were scared. When we moved to Manchester 15 days after we got married, I was taking deep breaths. But those were such incredible days. I rediscovered myself. I realized that my heart was capable of melting, that my eyes were capable of gleaming, that my legs were capable of going weak, that I was capable of falling in love, that I would not die of poisonous gases if I don’t fart. In college, Geet was the kind of girl who would stop talking to you if you ask her to be your girlfriend. She treated me like a lizard that has suddenly dropped in her lap from the ceiling when I tried to give her an innocent peck on the first day of our marriage. Like me, she too had her own battles to conquer. I waited patiently for her to come around. I worked on our friendship. Now that I look back, I cannot imagine the last three years without her. I married a stranger and fell in love with a friend. 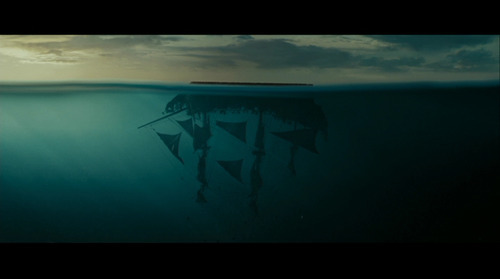 When I think of my marriage, I think of The Black Pearl, that was rocked upside down to be transported back into the land of the living at sunrise. Now wasn’t that lucky that ‘Up was Down’? p.s. I am looking forward to exchanging my dentures with Geet. That way, if we are left with one chocolate and she eats it all, I can still after-taste it. Thank you for your wishes Jas. What a stereotype breaker you are!!! How often do we read men talking about their fears so fearlessly!! Congrats and many, many happy returns Amit and Geet. Thanks IHM for all your wishes. We all have demons to fight. It wasn’t an easy decision for me. I could have wrecked someone’s life. But in the end, I chose to believe that I could be a good human being. I am sure you too will win in the end. 🙂 All the best to you. forget all those movies and literature about love – this is the most perfect love story! this should be read by all as a manual on forming lasting relationships. thanks amit. though we are not in the denture-sharing stage yet (still have a few years to go!!! ), we still are friends sharing our lives. imagine, a 24/7-friend! happy anniversary to geet and you. Excellent recount of the best phase of your life so far. And mentioning after-taste sums it up more profoundly than any bollywood movie! OMG What an awesome story. Happy anniversary to you guys and best wishes for a wonderful life ahead. That was such a sweet, heart-warming read. Looks like Geet is a very lucky girl, and you are a lucky guy to have her as well. 🙂 Wish you many, many happy anniversaries to come! And thank you for your wishes Swaram. Amit, that is a heartfelt and heart-warming tribute to your love to whom you lost your virginity, duly spiced with sparkling humour. Remember, I kept Mr Updike on hold to enjoy your story! May the light of a trillion stars twinkle on your chocolate-stained dentures! Thanks Uma for all your wishes. Losing your virginity is a very emotional moment indeed. Oh God! Mr. Updike will be tossing in his grave! Do give him immediate attention. I hope I don’t lose the dentures like my virginity. So one thing is certain. Whenever Geet and you have an argument in the future and she refuses to see your point, all you have to do is remind her of this essay. Hearts will be amelting in a jiffy! And really relieved for you that you won’t be dying a virgin! I crossed that bridge a long time back. 😛 In fact the days of pure virginity are now very hazy in my memories. BTW, are you coming for the Indiblogger meet on 8th? Ok, not essay, note from the heart! Undecided about the 8th. I have never attended a blogger event before. I am bit chary of being a pile-on at an event where the expectation might be to blog about it later. Considering that I have absolutely no intentions of reviewing it / blogging about it! But I do wish that some of us likeminded bloggers around this area get together sometime soon. I haven’t attended a blogger’s meet before as well. And I don’t think they are expecting us to write about it. I am just going for the experience. Think about it. I will give you my free autograph. I must thank you for this very wonderful post (I’ll try to post why I said that on my blog). Please do write your views. I would love to read them. What a cute mushy post, Amit! You are a sweet boy whose heart is in the right place. Wish you and your love a long life of happiness together. At the end of the day, our desires are simple and basic! Twelve years down the road and with kids in tow, I can tell you that the journey becomes more exciting and frustrating but like you I always bounce back to the basics to help tide over the rough times. All the best! Stay happy. I married a stranger and fell in love too. We will have to ask your lovely wife about your picture resembling a cross between didi and deva. Perhaps both of you are like the lead couple of a Yash Chopra movie……made for each other. Happiness Always. That has to be the sweetest anniversary post. May you guys share dentures and more:) Congratulations and here’s to many, many, many more such wonderful years for the two of you! That’s such a warm anniversary post, and that too coming from a guy took my heart away. Congratulations on your anniversary. May you remain best friends madly deeply in love always. P.s. I love the name Geet. Belated wishes to you both. I think it is something related to Feb being auspicious. A lot of people get married in February. That is so adorable. Made my heart melt. Perfect to read on a dreary saturday. And also perfect post to make you believe in love. 🙂 Happy Anniversary. Wish you many many more to come. completed a year on 24th feb…..Almost Same story… Same feelings…same pinch !! I could have written this post myself, considering the sentiment it conveys – not believing in love, marrying the “arranged” way and then rediscovering all over again – although the post, I’m sure, wouldn’t be as tongue-in-cheek as yours!! To make sure I never forget my journey, I have recorded it as my Matrimonial Mish-mashes in my blog. Not sure if you have read all of them. Thanks Ash for your wishes. Wowww… this is one of the sweetest i hav read that didnt make me diabetic. Happy-super-duper Anniversary to you and Geet. Keep writing and still waiting for your book. wow that was a mushy and very frank post – something one would not expect from a guy ! Really enjoyed reading it ! How can this be so mushy-mushy without being mushy-mushy..?? Sweetest post Amit. Happy Anniversary to you two. The last line is tooo cute! And thank you for all the wishes. This is such an “awwwwwwwwwwwww” post! Loved reading the in-side story. I must say, you both are really lucky! 🙂 I don’t believe in the powers of those matrimonial sites yet. As far as love is concerned, it is for other people. Happy Happy Anniversary to the both of you ! May you both enjoy the togetherness forever ! Hey – how do you write such heart touching posts – Yaar ! Awesome ! 11 years? Wow! That is like forever. Geet and I talked for almost a month before we said yes. Our family was ready to give us more time but we were sure by then. I can show you that photo but then I will erase your memory by that flash light they used in MIB. Is that ok? god u r so mean 😛 The pic can’t be that bad if Geet has said YES after seeing it right ? Happy anniversary Amit & Geet-may your happiness keep multiplying with every passing day.This was such a cute post,it left a lingering feeling of pleasure. A beautiful post, Amit. Reminded me of “grow old with me, the best is yet to be”. Wishing Amit and Geet a Happy Anniversary, and may the years ahead be always full of love, togetherness and shared joys. Belated happy anniversary Amit & Geet! Congratulations on completing 3 beautiful years together & wish you a lifetime of happiness! 🙂 Thanks a lot for this post Amt! Am going to tie the knot in 4 days, in the arranged through matrimonial site way. Apart from the wedding exvitememt, am a bunch of nerves right now. This post is like a moral booster for me. Hope I’ll be able to share a nice story few years down the line. Fingers crossed! Glad you wore your heart on your sleeve for this one, Amit. Hope you and Geet have a great time discovering more about yourselves and one another as you grow old together. Best wishes 🙂 Really happy for you both! Stay blessed!!!!!!!!! I am someone who share a similar feeling which you had before you met Geet. The word marriage freaks me out and arranged marriage freaks me out even more. Your story is inspiring. Belated anniversary wishes to you and Geet. Wish you all the happiness and all the good things in life for many many more years to come. “On a scale of Sunil Shetty to 10, I looked like Tushar Kapoor. The best way to treat your spouse is to treat him/her as your friend…I totally agree with that. Can’t understand why some people don’t realise this. Loved this post too and I’m sure Geet is one lucky woman. Yes, you have to be friends first. The rest of it follows. I actually fell in love with Geet’s character in Jab We Met. I haven’t seen the TV show. Oh this is so heart-warming in the cold Manchester!! 😀 I saw the video you put up on FB. This is so najar-na-lage-wala-cute!! Many congratulations and keep the love flowing! BTW, Geet ever considered making a guest post on your blog?? Belated Anniversary wishes to you and Geet 🙂 wish you celebrate many more happy Anniversaries together! I didn’t know Geet was her blog name, but whenever I read about her in your blog I had the image of Geet from JWM. I really loved that character. Haha! I was very sure I would not subject another human to the atrocoties. I wish both of you a lifetime of happiness, love and joy. You have penned it down beautifully. 🙂 It’s arranged-marriage stories like these that assure me that everything’s going to be alright. Trivia: My parents are on a groom-hunt for me. Firstly – happy anniversary and secondly – what a brilliant post – a stranger to a loved friend…brilliant. Thanks pseudomonaz. 🙂 Yeah, she is as crazy as her. Well almost. Haha! No I don’t have a younger brother. Unfortunately. I was kidding. I am already in a relationship, a messy relationship to be precise. Unlike you i believe in love but i just don’t believe in marriages. And i now believe that ‘someone’ doesn’t exist. I think the best way to deal with relationships is to go with the flow. Pain is inevitable, suffering is optional. That’s what i am doing. Waiting for everything to get better. My blog has been blocked at a lot of places. I hate it when they treat it like a Po*n site! *shock* Some Law School that is!